Blog Appetit: Don't You Wish They All Could Be California Kugels? The California Kugel sounds great, but I'll have to make some changes so it will fit in with a Shabbat meat meal. 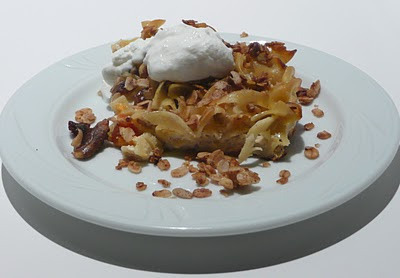 This is very definitely a dairy kugel! I wouldn't have even thought to serve it with a meat meal! Maybe shabbat lunch or after a vegetarian meal? A note about any traditional Jewish recipes or menus on Blog Appetit. I work hard to respect the appropriate dietary laws for these recipes and menus. If something is of questionable kasruth in the dish, I'll point it out and suggest options.